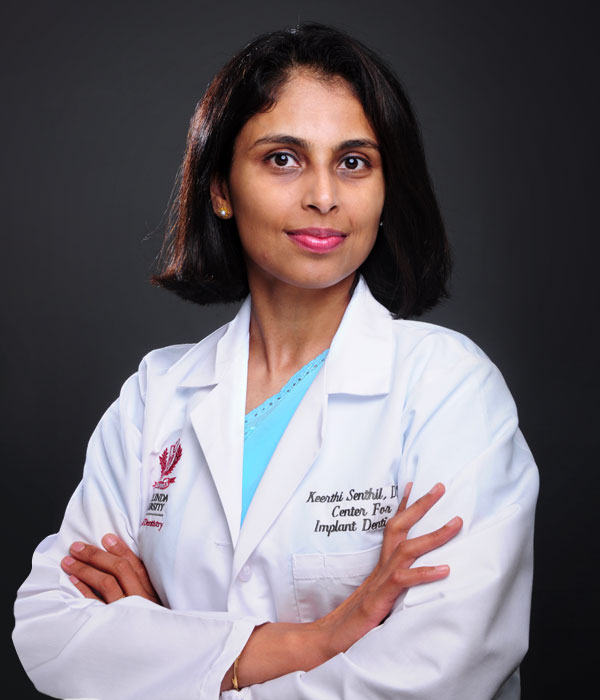 Dr. Keerthi Senthil is known for her gentle and creative touch. She enjoys helping each of her patients improve their health, appearance, and self-esteem by creating the smile of their dreams and also maintaining the health and function of their teeth, gums, and bite. Dr. Keerthi Senthil has been practicing dentistry for the past 21 years. She has a Masters in the field of Oral Implantology from Loma Linda University. She is board certified and is one of the 445 dentists who have been credentialed with a Diplomate status in the field of Oral Implantology. She is also a Fellow of the American Academy of Implant Dentistry. Advanced education and continuing dental study allows her to offer her patients a superior dental experience and an unparalleled level of quality care. She is truly committed to excellence in everything she does. My name is Dr. Keerthi Senthil. Being a general dentist for over a decade I always felt that patients deserve better. Patients are in need of stable replacements for their lost teeth and only dental implants can provide that. So, I went back to school to pursue a Masters in the field of Oral Implantalogy at Loma Linda University. I am a Diplomate in the field of Oral Implantology and Fellow of the American Academy of Implant Dentistry AAID. I credit my family for my achievements. My husband and parents have been extremely supportive and I thank God for blessing me with such an awesome family. I have two daughters Isha, Lakshmi and a son Karthik. They put up with my long hours at school and always wondered why mom had to go to school at this age! Although I love doing dentistry my life revolves around my family. They are the key to my success. I enjoy biking, swimming and travelling with them. I have been practicing Yoga since a very young age. It has helped me to be focused and multitask. I love visiting different countries and learn about their culture and heritage. I am waiting to meet all of you in person. Please feel free to call the office if you want to talk to me. I am looking forward to hearing from you !!! !